Cheers is the Cheers Pub in Boston as well as a television show that ran from 1982 to 1993. I had to explain this to my 20 sumpin’ son who didn’t know about the much-beloved Cheers television show & the various spin-offs that came from it. My Mom and I used to love to watch Frasier more than Cheers. My son says that figures coz Frasier is kind of hoity-toity like I am…well, I’ve come down in the world if that was ever the case, lol! Thanks for that, I think, Kraig, sweetie. Cheers Boston Baked Beans are noticeably different from most baked beans. First of all, they’re not sweet tasting, even though they have a little molasses and maple syrup. Instead, they’re almost a little tangy with a bit of sharpness from the dry mustard and vinegar. (Both of these items are in my Top Secret Super Stealth Arsenal of Ingredients.) I think they’re a nice change up from the more standard sticky sweet Baked Beans. Even though I’m not a huge fan really sweet beans, I sometimes add a little brown sugar to my Cheers Boston Baked Beans, especially if I’m serving to company that might expect that sweetness. Now & then you need to throw caution to the wind, lol! 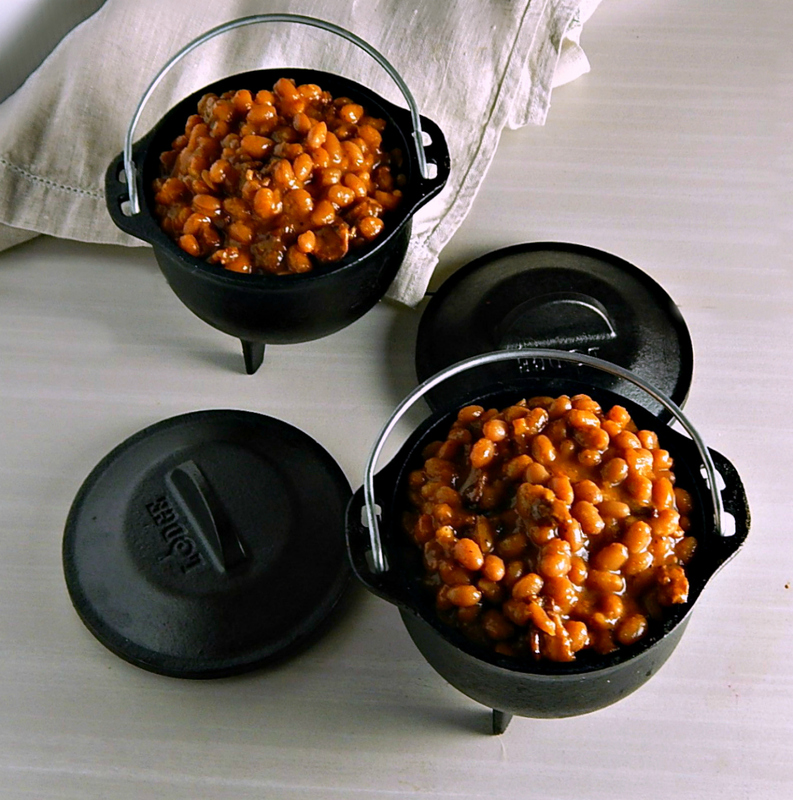 The recipe for Cheers Boston Baked Beans Instant Pot or Not also calls for a pound of bacon! Talk about throwing caution to the wind! My little secret is I cut that in half. I still get the smoky, silky deliciousness with fewer worries about my health. And speaking of health, navy beans are full of protein & all kinds of essential minerals and help stabilize blood sugar. Check out what the World’s Healthiest Foods has to say about Navy Beans. Cheers Boston Baked Beans Instant Pot or Not, as the name implies, can be, you got it, made in the Instant Pot or slowly baked in the oven. Both have advantages. While I’ve made these in the oven for years, I haven’t made them often, because it’s a four-hour bake. Fine on a winter day if you’re snowed in or around the house on a lazy weekend, but who wants to run the oven in the summer when it’s hot and there’s so much going on? That makes the IP your very special friend when you want Baked Beans as a barbecue side. The beans are a little soupier from the Instant Pot and don’t get quite the caramelization as the oven version does, but they’re every bit as delish in their own way. I suppose you could toss them in a pan and finish them off in the oven. Maybe you want to do that anyway if you’ve cooked them ahead and are holding them for dinner. Jest slowly reheat them in a big 9 x 13″ pan. And speaking of the Instant Pot? You’ll have these beans on the table in about an hour with no worries about heating up the kitchen, no hassles of babysitting or opening up that hot oven to stir the pot. Long cooking recipes like this are where the Instant Pot really shines. If you’re a follower, you know beans show up on a regular basis around here. They really are a bargain protein. Look for them on sale after holidays where ham is served. They’re not usually advertised, but check around Easter, Thanksgiving, and Christmas. It’s worth taking a peak around Cinco de Mayo, too. Stock up for the year on Vinegar around Easter when everything from basic to fancy is usually on sale, and Molasses is usually rock bottom between Thanksgiving and Christmas. Bacon is usually on sale during holiday weeks, too. Stock up and freeze. Bacon can be brought out of the freezer, cut through and replaced. It might need to sit on the counter for a few minutes. We are not big bacon eaters at our house – it has gotten so pricey and isn’t the greatest for you, but I can’t resist using it as a flavoring. One item I haven’t talked about a lot is Maple Syrup. I never see the real stuff on sale. If you’re lucky and have a friend who lives in a producing region, hit them up. Costco has great prices for their Kirkland brand. Maple syrup is one thing I’ll buy over the grocery store syrups, even if I have to dole it out like the precious commodity it is. I’ve been known to keep the good stuff for myself and let the kids have the stuff in the plastic bottles, just because they seem to drown their pancakes in it! A little of the real stuff goes a long way. Rinse and drain soaked beans, set aside. In a large Dutch oven, add bacon and onion. Turn heat onto medium-high and cook until bacon is crisp. Drain excess fat if desired. Add the remaining ingredients and stir in beans. Bring to a boil and transfer to the oven. Bake uncovered, stirring now and then for about four hours, until beans are tender, checking several beans. Watch closely at the end of the cooking time, adding additional water if needed. Rinse and drain soaked beans, set aside. Add bacon and onion to the Instant Pot, turn to the Saute setting. Cook until bacon is crisp. Drain excess fat if desired. Add the remaining ingredients and stir in beans. Seal the Instant Pot and cook on High Pressure for 45 minutes. When finished, let release naturally for 20 minutes. until beans are tender, checking several beans. If additional time is needed, reseal and set for five more minutes at High Pressure and let naturally release for 20 minutes. Sometimes I add 1/3 to a half a cup of brown sugar and they are just barely sweet. I’ll be bringing Warm Spinach Chicken Mandarin Salad to Fiesta Friday #226, hosted this week byJhuls @ The Not So Creative Cook. This entry was posted in Click here for Fabulous Food Posts and tagged Bacon, Boston, Cheers, Dried Beans, hearty sides, Maple Syrup, molasses, navy beans, New England, Side. Bookmark the permalink. I believe I had a typo. Thank you for the correction. Hi, sorry for the late reply, and thanks! I think they’re highly underrated!! they look so wholesome. am sure they are good enough for a complete meal ! Thanks, and yes they are! I actually had the leftovers for a couple of meals, just by themselves. I think they get even better the next day. Which is good because they do make a big pot. Looks like a winner Mollie! Like the idea of maple-sweetness (but not too sweet) and of course, bacon! Did thy get the thumbs up from Kraig?? hugs hugs from here! They DID get the thumbs up, but Kraig eats anything, lol!!! Sorry for the late reply, Rhonda – I’m having issues w my computer/internet/blog….who knows!! Maybe all three, lol! Yes, you wonder where they put it all! No!! But soon, I hope!! It’s taking like three or four minutes to even answer a comment. I’m changing internet providers. Next week. It’s been delayed. Then I can visit again! I miss everyone, and miss your delightful adventures!! Hi Chef, thanks! They hit the spot!